Jim Clemens Collection No.27. A record of the demise of steam on British railways during 1967 and 1968 in the North-West of England, seen mainly through the camera of Jim Clemens. Into the early days of standard gauge preservation in 1968 and we cover the opening of the Keighley and Worth Valley Railway. We next visit Tyseley shed in September 1968 and finally 6000 “King George V” returned steam to British Railways in 1971 to end a record of what was to be seen in these declining years of steam traction. Further volumes are available covering the age of steam on British Railways throughout Great Britain, including many others from the Jim Clemens collection. Details may be obtained from the address below. Cover Photo:- Keith Pirt/Courtesy Booklaw Publications : 45342 and 45156 at Nappa, 20/4/68. The story of electric traction in the British Isles from the Volks Railway to the West Coast Main Line electrification over nearly 80 years. In the beginning, trams took away trade from the railways who had to look to electric traction themselves in the towns and cities to retake that trade. Electric services grew up around places like London, Manchester, Southport, Glasgow, Morecambe, Tyneside and Altrincham over the years. Using archive film these systems can be seen, some still using early rolling stock into the 1960′s. 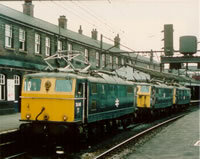 Main line electrification followed with the Woodhead route in the 1950′s and then the West Coast main line in stages with new AL electrics at Crewe. Other systems examined are the Grimsby and Immingham, Swansea and Mumbles, Isle of Man and Blackpool. An industrial line in the North East is also featured. There are many different voltages and third rail and overhead systems shown. Fascinating and rare views are in this film. Filmed mainly in colour but with some black and white footage. A detailed commentary and authentic soundtrack completes a nostalgic record of electric services throughout the British Isles. with something different to offer. 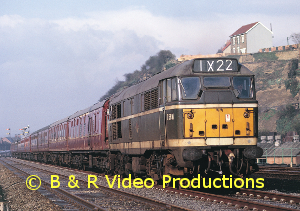 A detailed film of the railway in the Peak District of Derbyshire which closed as a through route in 1968. There is extensive coverage of the CROMFORD & HIGH PEAK RAILWAY which ran over the 1000 ft. contour in windswept conditions. It had the formidable HOPTON incline at 1-in-14 which taxed loco skill to the limit for the J94’s seen here. Then there were the 8F’s from BUXTON shed where a visit is made to see them in the snowy February of 1968. They are seen taking the limestone traffic through PEAK FOREST. There is also a DMU journey from Millers Dales along Ashwood Dale to Buxton. 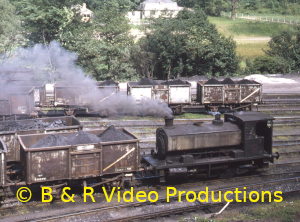 HEATON MERSEY shed is visited (showing shed activities such as coaling 8Fs) including the last day of steam there and some views along the line to MANCHESTER CENTRAL and return to MILLERS DALE. 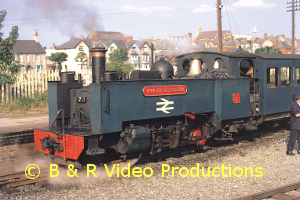 This is a worthy record of those halcyon days of steam, filmed mostly in colour on 16mm format. Accompanying the film is an authentic soundtrack with an informative commentary.